When we’re talking authentication the first thing that pops up in our minds is Active Directory. For years, active directory has been the staple identity provider for most companies and the foundational building block upon which most applications were built. 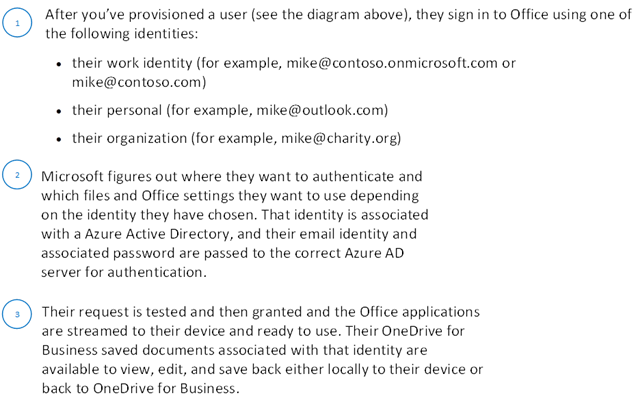 With Azure and O365, we need to think about the different authentication methods that could be. Are we going to an “all in the cloud” model? Federated identities? Hybrid active directory? Or maybe something else completely? With the first possible solution we’re looking at an identity solution where nothing exists on premise. The most unlikely solution for the larger businesses, but if you’re a small or new business, this might be an option. You’re still in charge and you can still do, pretty much, the same things when it comes to authentication, but you’re hosting all your user information in the cloud with no servers on-prem. Most of the world does not live in an all Microsoft cloud only world. Companies have existing infrastructure, applications that need time to be ported and so much more items that restrict them from doing away with existing on-prem servers (and thank god for that or we would be out of a job!) that living in a hybrid world is necessary. But what does that look like? Behind door number one is the same-sign on option. 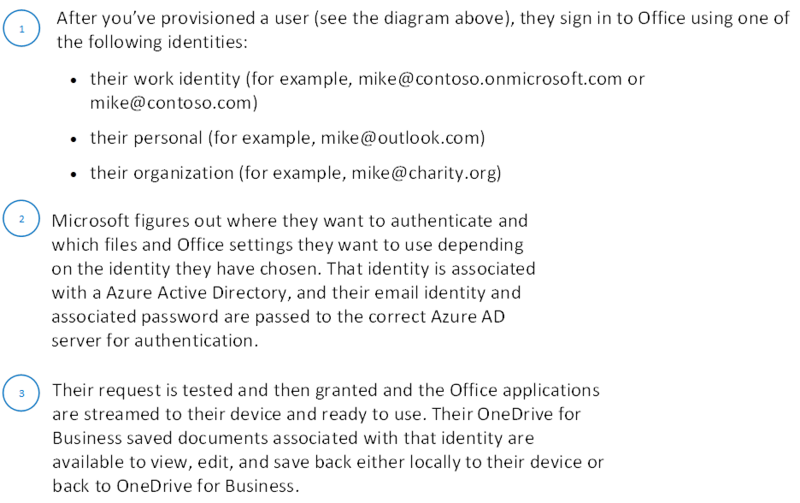 Minimal on-prem infrastructure (a dirsync server is required) allows companies to leverage the “same sign-on” method. Historically the DirSync server would not sync end users password but we have that possibility now. OK, before anyone freaks out, let me clarify: Password Sync does not synchronize the password. It has no way of doing that. What it actually does is take the hash of the users password that exists in active directory, hashes that again, and syncs it up to Azure Active Directory. That way, Users can be authenticated using the same password they have in their on-prem active directory. But they will have to authenticate again. It is not single sign-on! Single sign-on is what Microsoft preaches, but does require some extra infrastructure. For a start, you will need at least one ADFS server in order to authenticate against. Ideally you would have multiple so there is redundancy and you don’t lose your authentication infrastructure due to patching. Authenticating against an ADFS server also means that users don’t need to re-enter their credentials when they are already logged in. Hence the name “Single Sign-On”. 2. The application redirects the user to Azure AD for authentication. 3. 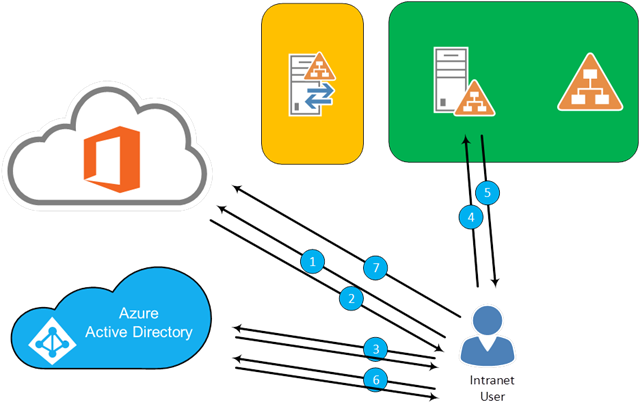 The user enters the username for the application and, because Azure AD knows ADFS has been set up, redirects that user to the ADFS server for authentication. 4. Since this is a Single sign-on scenario, and the user is working on a desktop which is domain-joined, ADFS issues a user token. 5. User token gets sent to the Intranet User. 6. The User token gets sent to Azure Active Directory, is validated and generates a new token for the application the user is trying to access. 7. The user can happily use the application. 1. Our extranet user tries to access the application for the very first time. 2. The application issues a redirect to Azure AD. 3. Once the redirect is processed, the user enters his or her credentials in the webpage. Azure AD, knowing the organization has ADFS enabled, issues a redirect to the ADFS server. 4. As the user is using the internet (Extranet) to access the ADFS server they hit the ADFS Proxy server which proxies all traffic to the ADFS server living in the internal network. Just like with the Intranet user the ADFS server issues a token. 5. The token gets sent to the user. 6. The token is passed on to Azure Active Directory, validated, a new token is created and passed down to the user. 7. The token is then used to authenticate against the application and the user can start working with vigor!